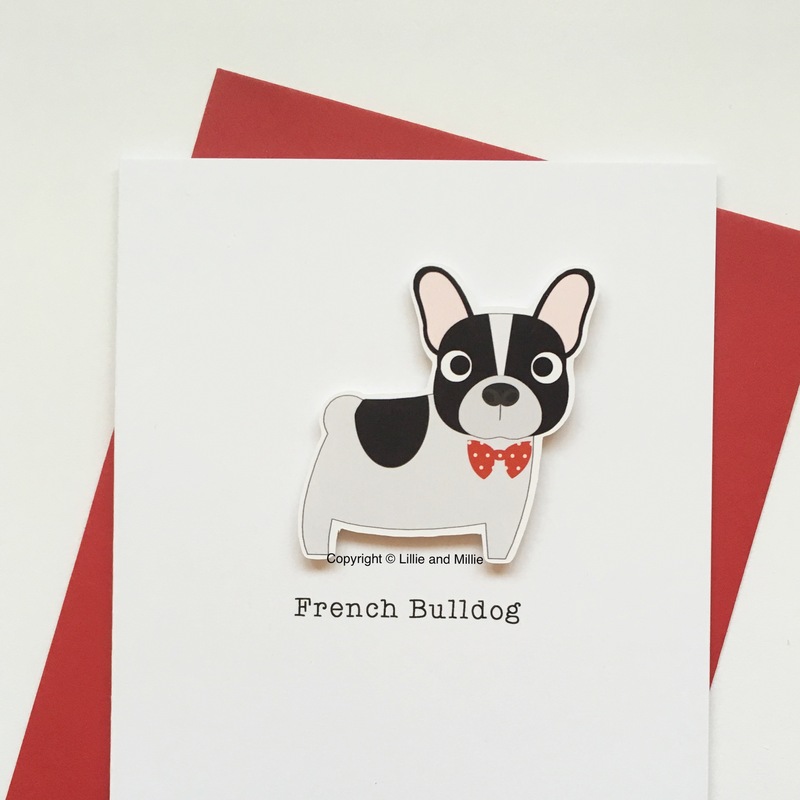 Our super cute Frenchie breed cards are simply pawfect for most occasions and guaranteed to brighten any dog lovers day. 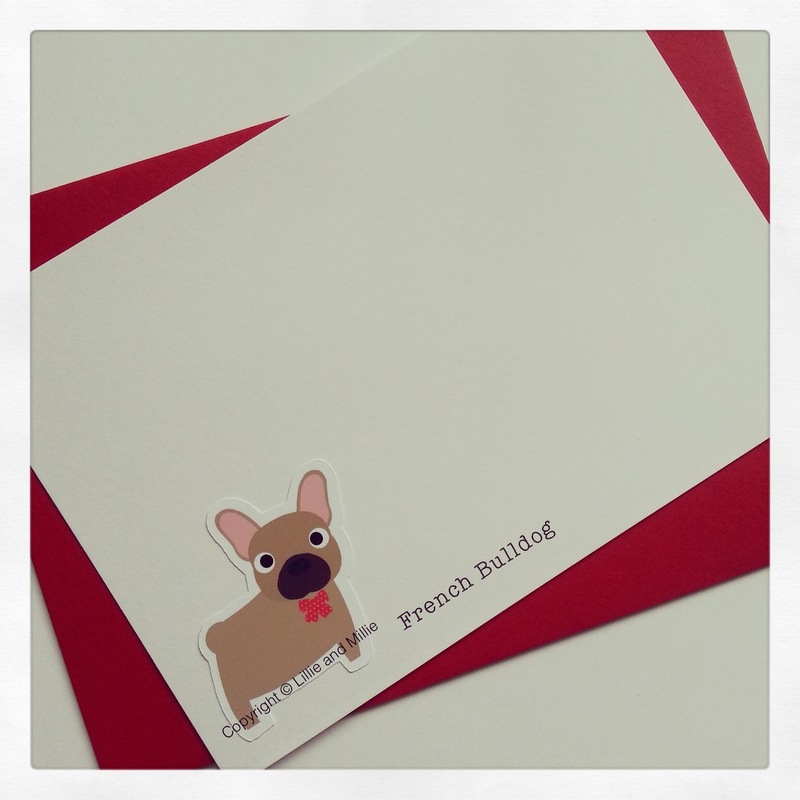 Our fawn French Bulldog breed card with a red polka bow tie. Want to personalise with the name of a pooch? 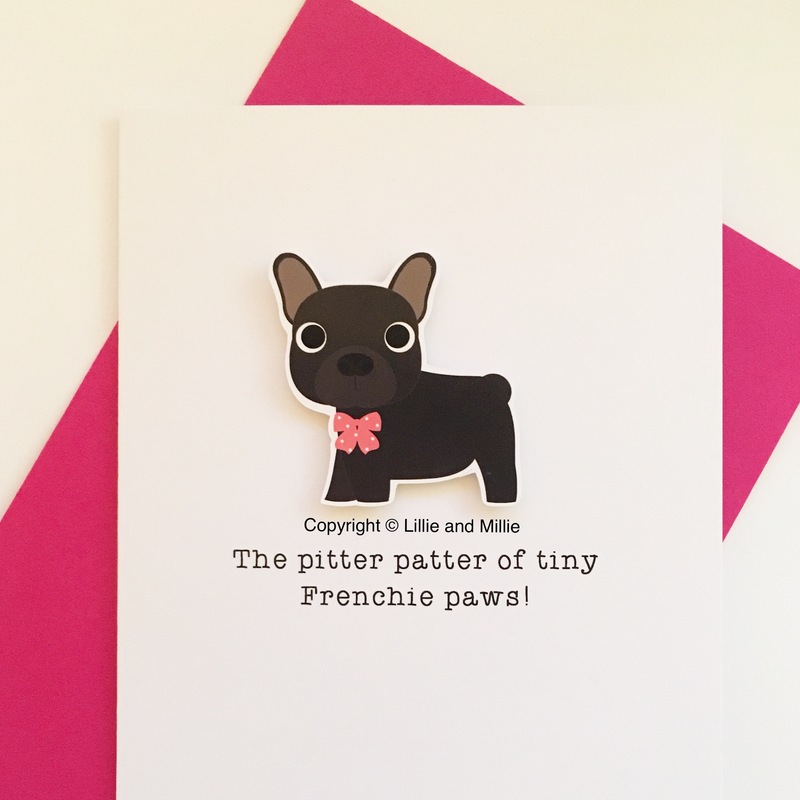 Then please email your requirements to sales@lillieandmillie.com If you wish to purchase from outside the UK please contact us for shipping costs before you purchase. 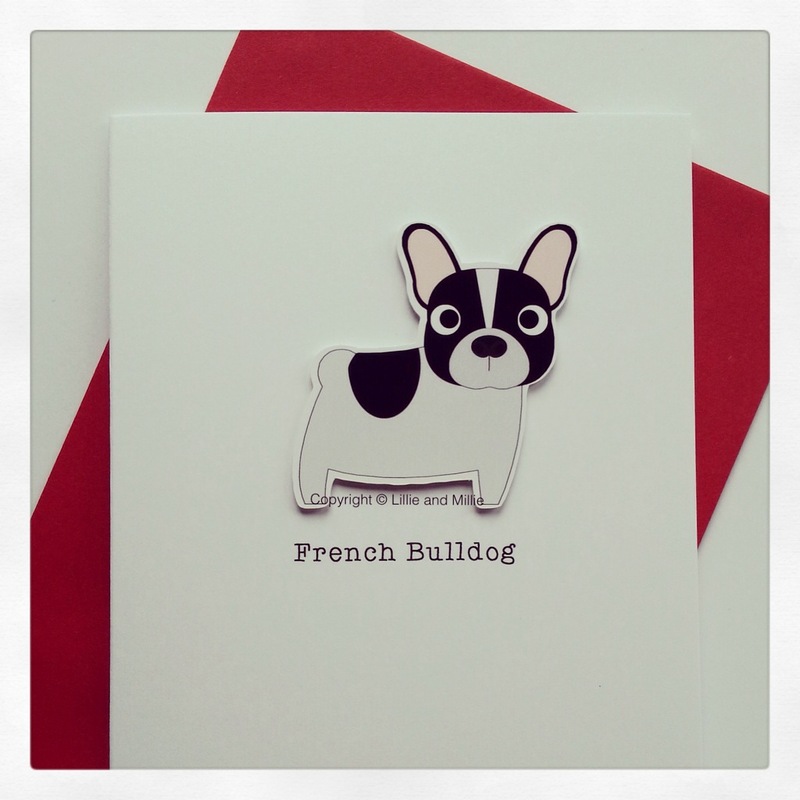 Our standard French Bulldog breed card. 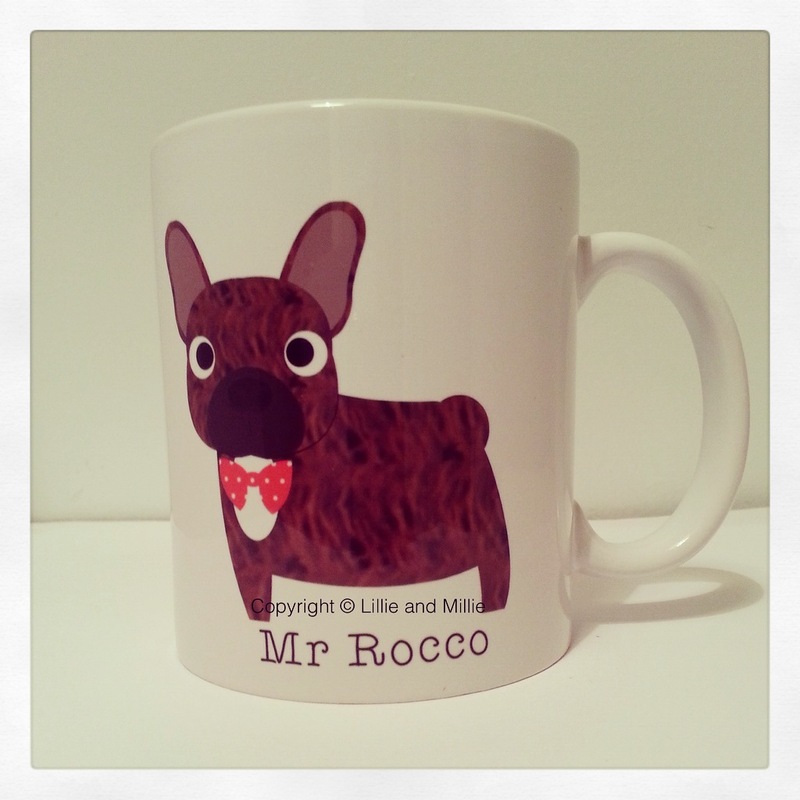 Want to personalise with the name of a pooch? Then please email your requirements to sales@lillieandmillie.com If you wish to purchase from outside the UK please contact us for shipping costs before you purchase. 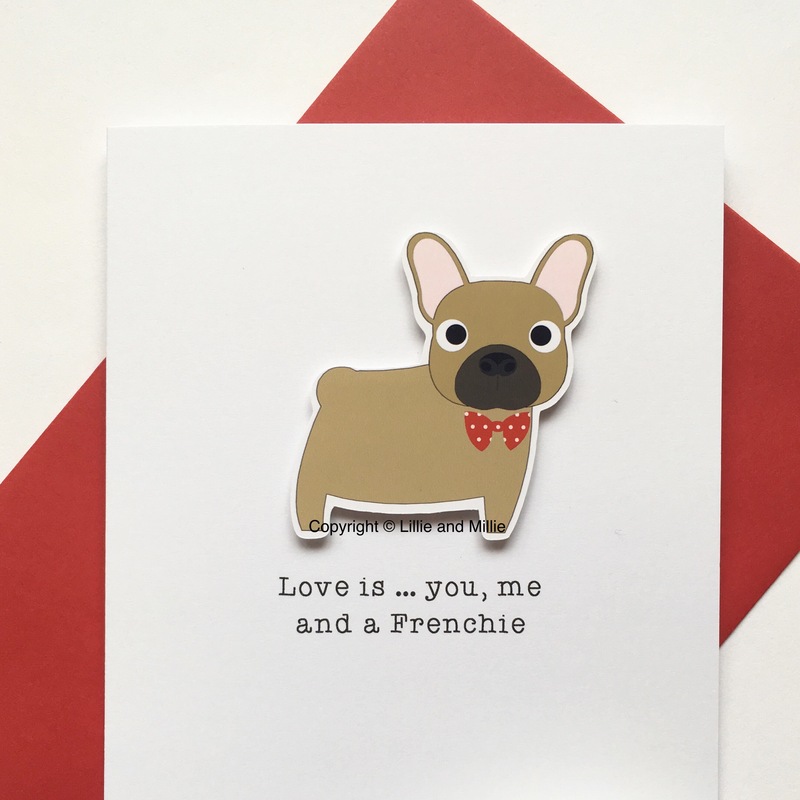 Our Love is fawn French Bulldog card. Also available in other colour ways, please email us with your requirements. Want to remove the bow tie? Then please email your requirements to sales@lillieandmillie.com If you wish to purchase from outside the UK please contact us for shipping costs before you purchase. 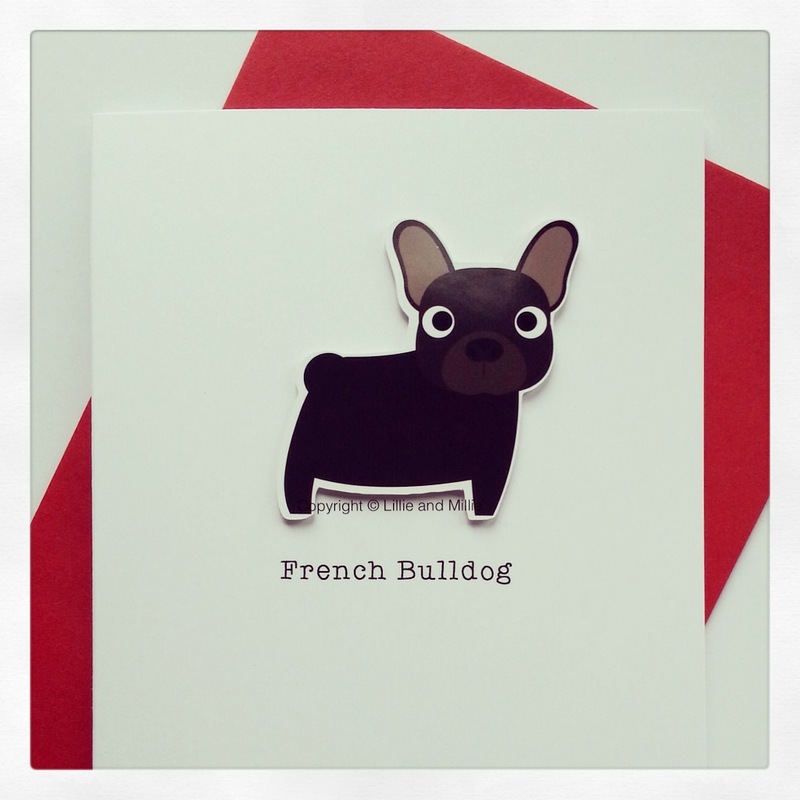 Our black French Bulldog breed card. Want to personalise with the name of a pooch? Then please email your requirements to sales@lillieandmillie.com If you wish to purchase from outside the UK please contact us for shipping costs before you purchase. 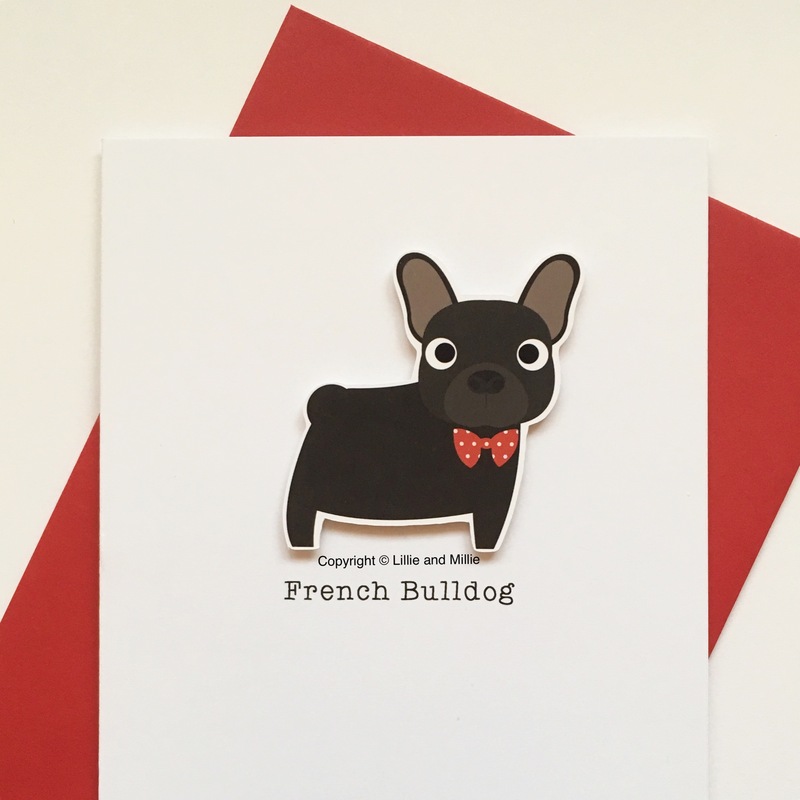 Our black French Bulldog breed card with a red bow. Want to personalise with the name of a pooch? Then please email your requirements to sales@lillieandmillie.com If you wish to purchase from outside the UK please contact us for shipping costs before you purchase. Our white and black French Bulldog breed card. Want to personalise with the name of a pooch? 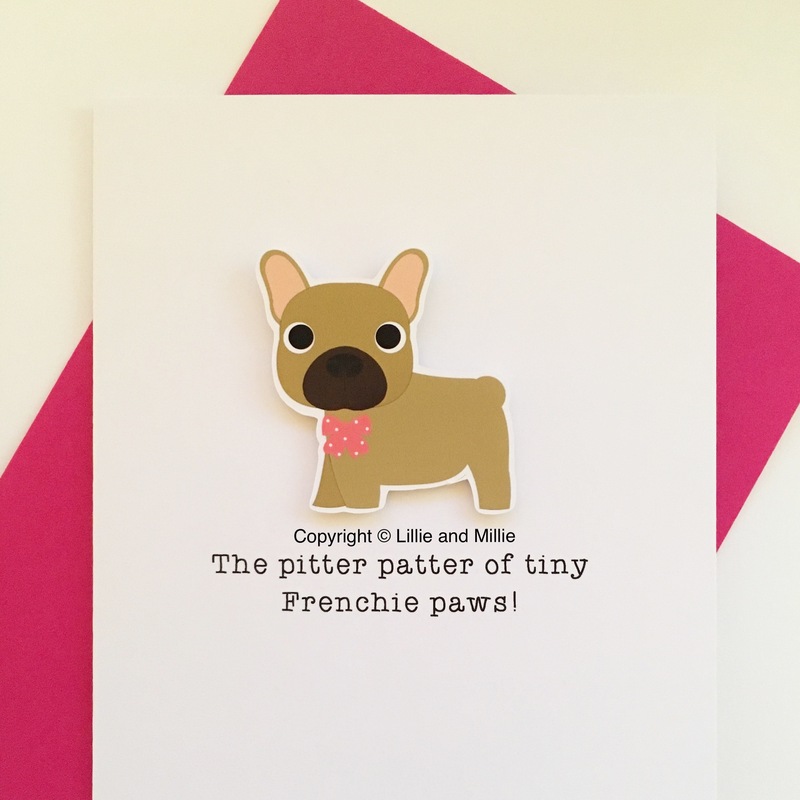 Then please email your requirements to sales@lillieandmillie.com If you wish to purchase from outside the UK please contact us for shipping costs before you purchase. 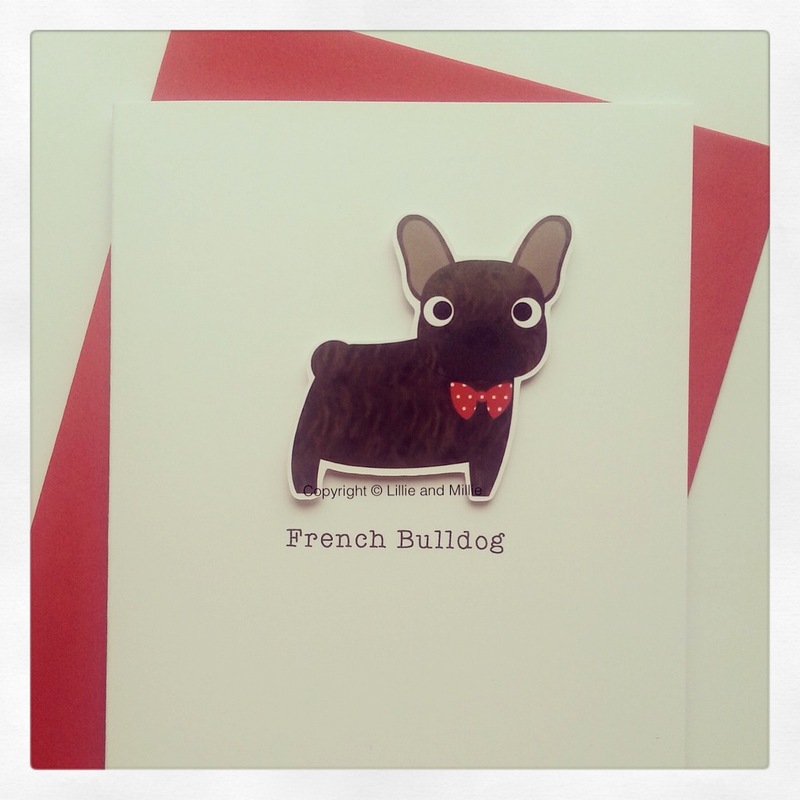 Our white and black French Bulldog with a red bow tie breed card. 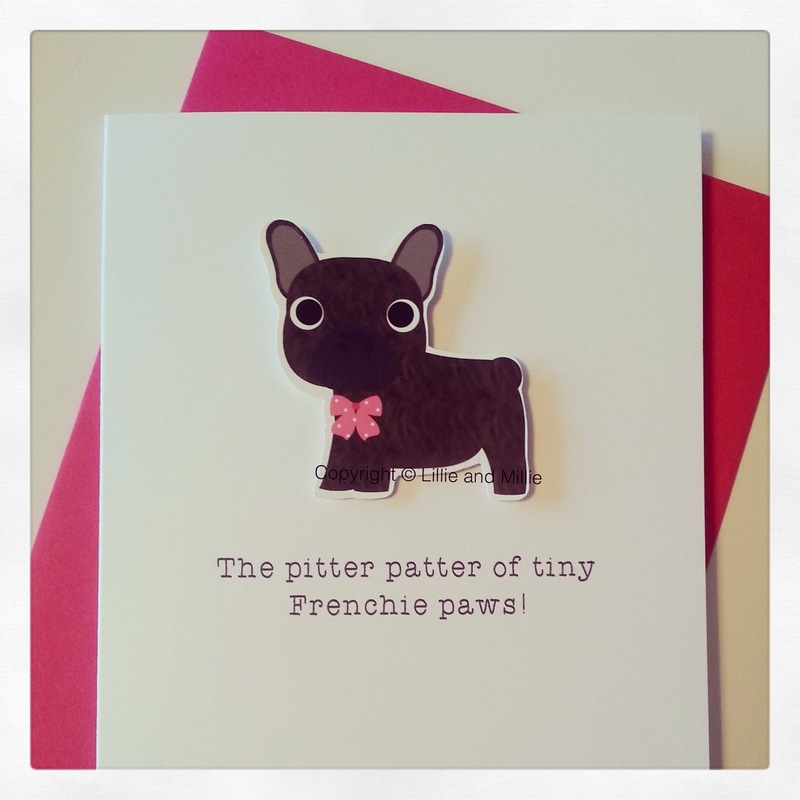 Want to personalise with the name of a pooch? 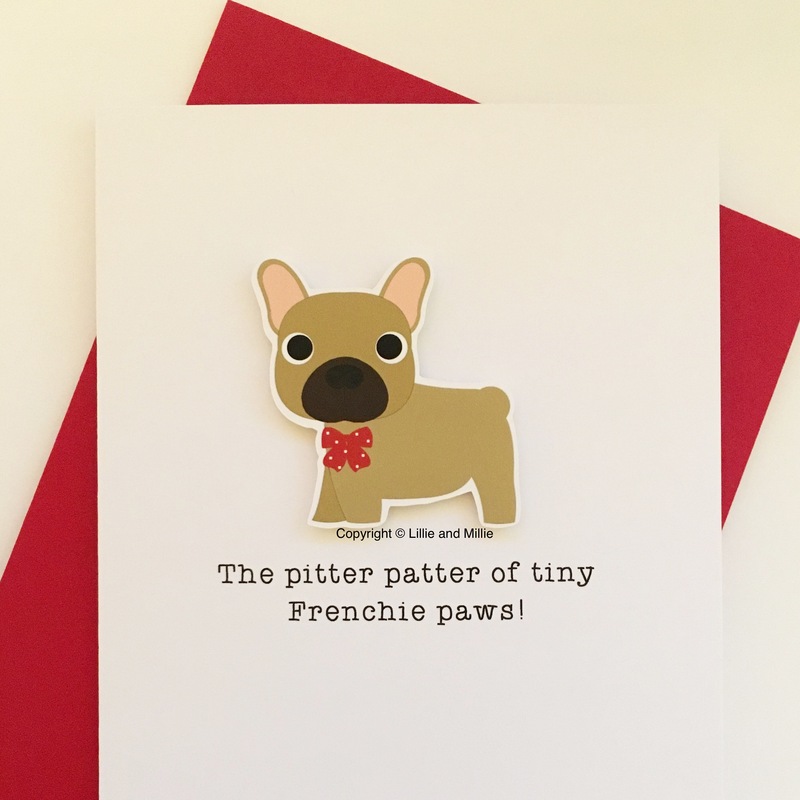 Then please email your requirements to sales@lillieandmillie.com If you wish to purchase from outside the UK please contact us for shipping costs before you purchase. 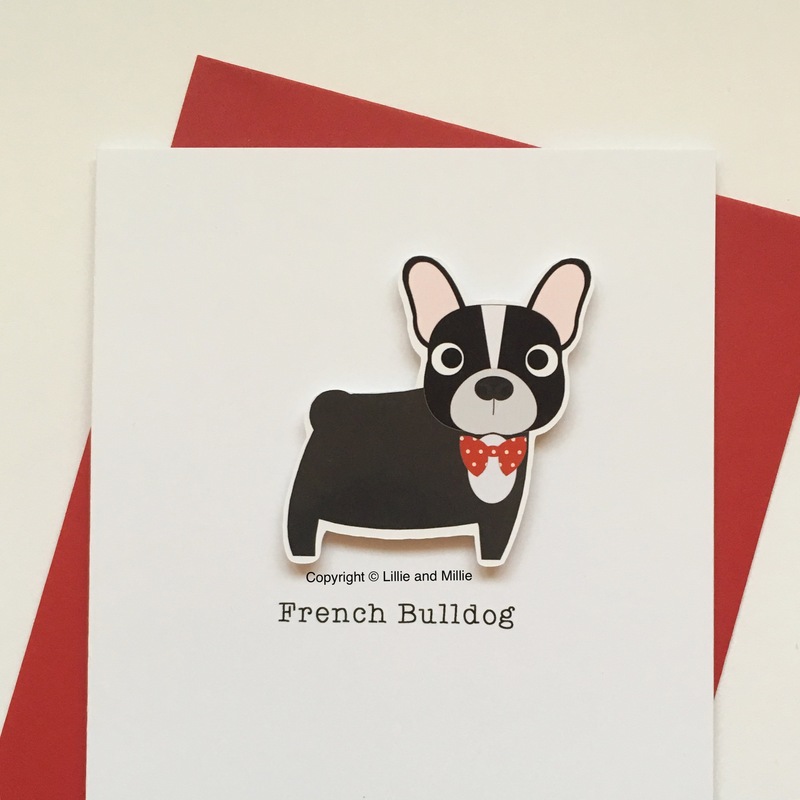 Our black and white French Bulldog with a red bow tie breed card. Want to personalise with the name of a pooch? Then please email your requirements to sales@lillieandmillie.com If you wish to purchase from outside the UK please contact us for shipping costs before you purchase. Our brindle French Bulldog breed card with a red polka bow tie. Want to personalise with the name of a pooch? Then please email your requirements to sales@lillieandmillie.com If you wish to purchase from outside the UK please contact us for shipping costs before you purchase. 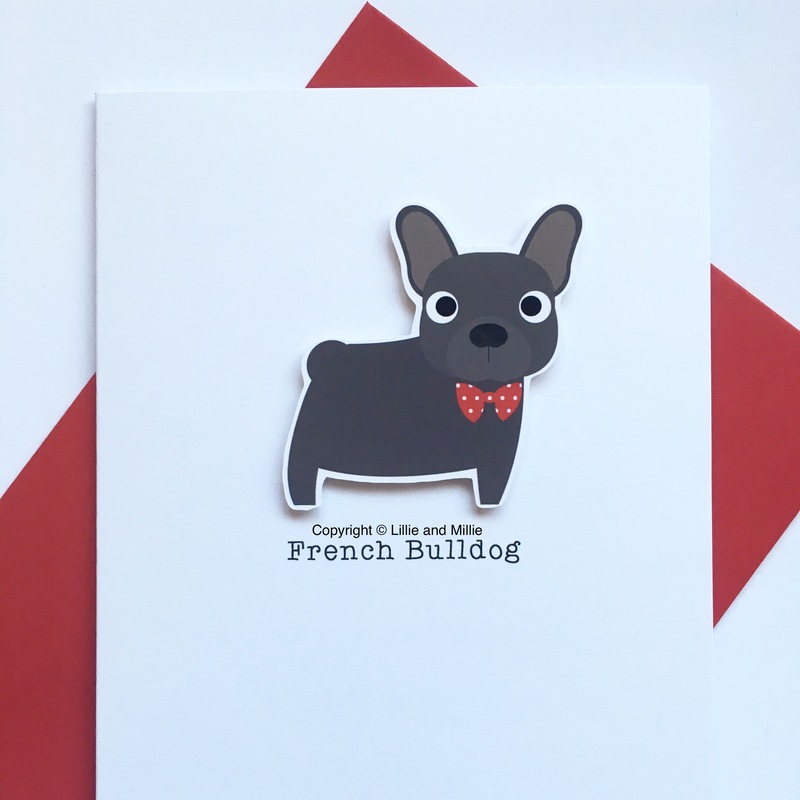 Our blue French Bulldog breed card with a red polka bow tie. Want to personalise with the name of a pooch? Then please email your requirements to sales@lillieandmillie.com If you wish to purchase from outside the UK please contact us for shipping costs before you purchase. 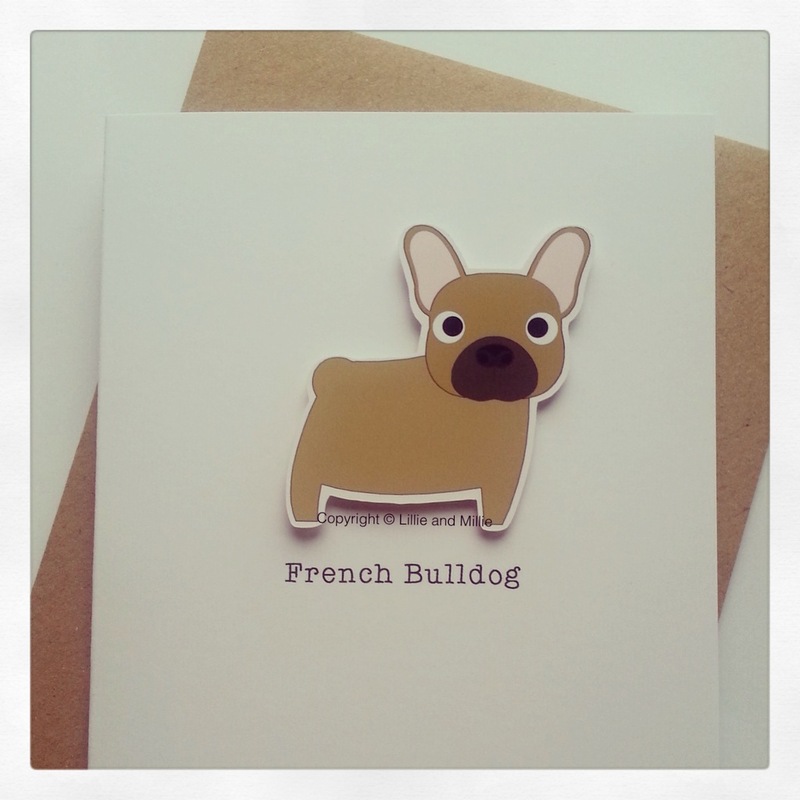 Our super cute fawn French Bulldog puppy breed card is pawfect to congratulate new fluffy arrivals. Left blank inside for your special message. If you wish to purchase from outside the UK please contact us for shipping costs before you purchase. 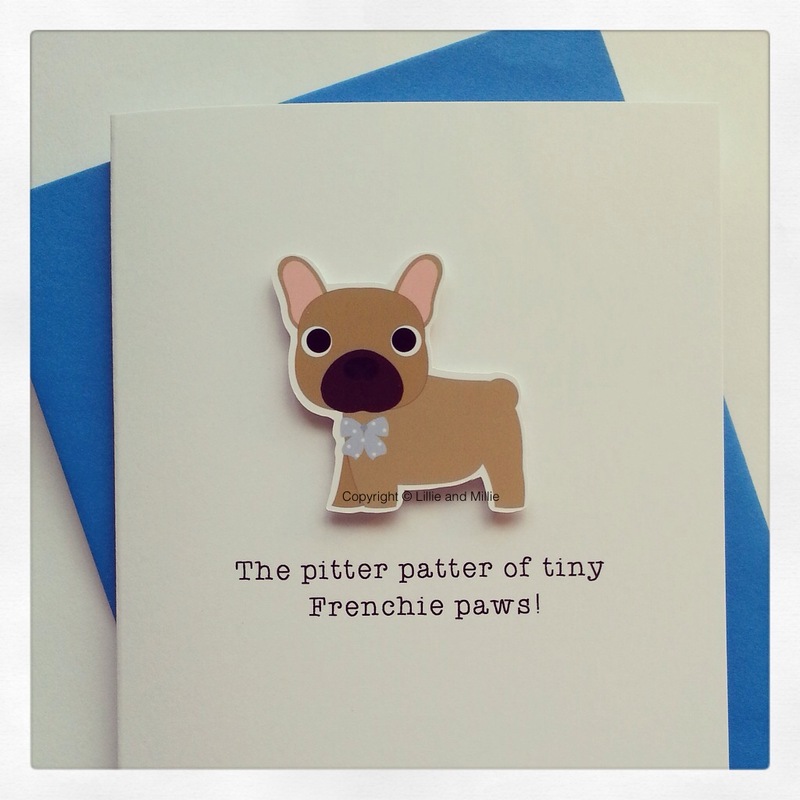 Our super cute brindle French Bulldog puppy breed card is pawfect to congratulate new fluffy arrivals. Left blank inside for your special message. If you wish to purchase from outside the UK please contact us for shipping costs before you purchase. 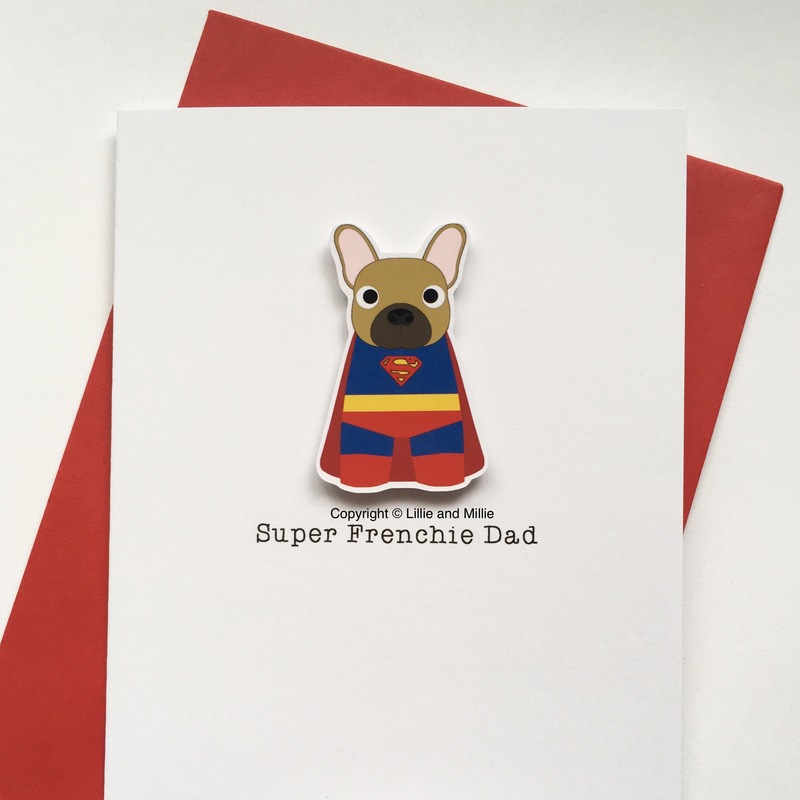 Why not send your precious pups off to their new forever homes with one of our super special personalised puppy cards for their new owners to cherish! 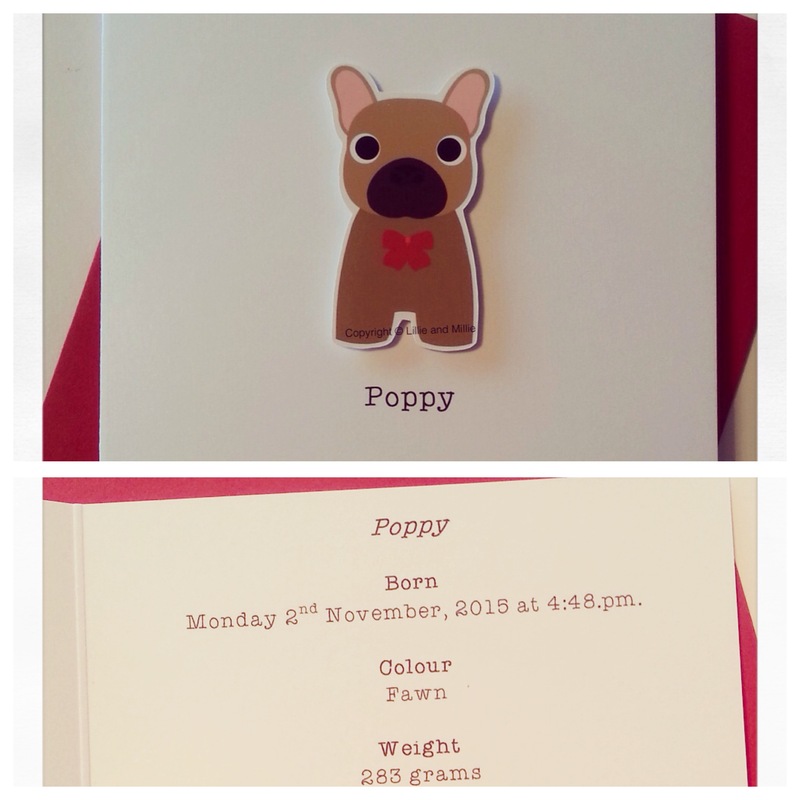 We can include details such as time and date of birth, weight, colour, kennel name, contact details and a special message from you! The cards are available in any colour way and any quantity can be ordered. Please contact us if you require a large quantity as we can offer a discount. Please email sales@lillieandmillie.com with your requirements or any questions. If you wish to purchase from outside the UK please contact us for shipping costs before you purchase. Our Cute and Cuddly adorale gift tags! The pawfect way to complete any gift! Each pack contains 5 identical tags. All breeds are available in many colour ways. 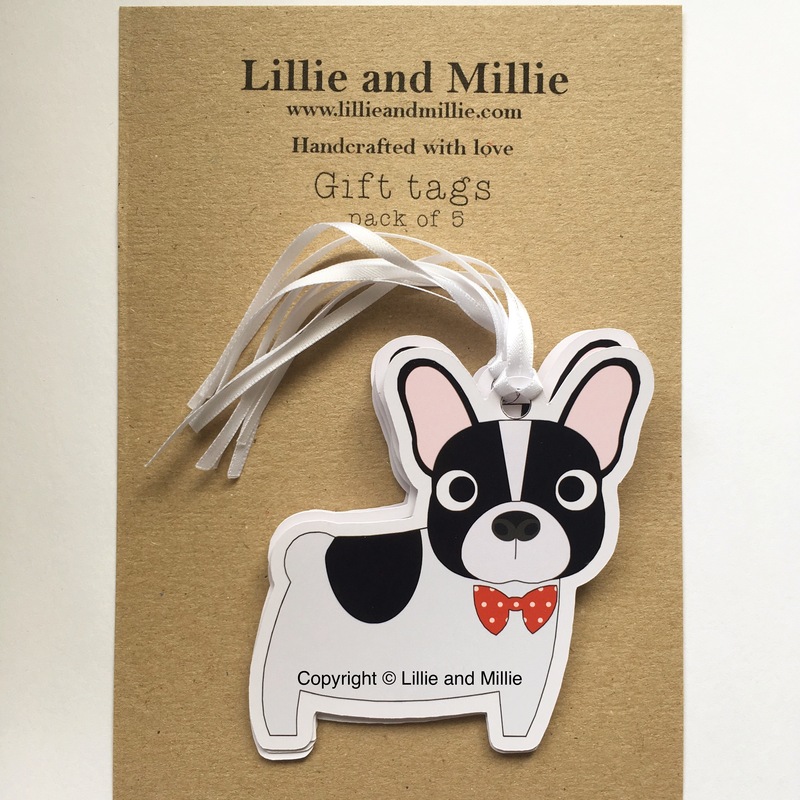 If the breed/colour you require is not listed then please purchase this set and once you have purchased the tags please send us an email containing the breed you require and any colour requirements that you may have: sales@lillieandmillie.com We cannot wait to hear from you!